Own a Local Business? 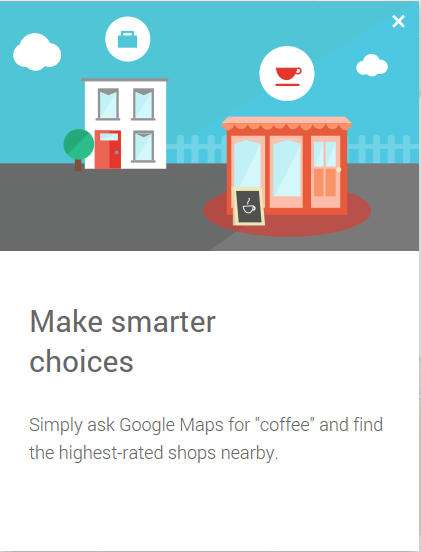 Then You MUST See This Screenshot From Google! Last weekend I was in a rush to take my daughter to an event at a local school I’d never been to before. So I headed over to the computer, typed the school’s address into Google Maps and was met with a screen and short slide show welcoming me to the NEW Google Maps. As I started fast-forwarding through the slide show so I could get the directions I needed, one slide leaped out at me and I froze. Not having much time, I took a screenshot of what I say and want to share it with you here. Now if you blink, you might miss what the bid deal is here. 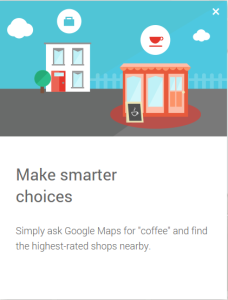 See, this slide is about how Google is making it easier for you to make “smarter” choices when you’re looking for local businesses. That’s right, the number and quality of the ratings your customers leave about your business on Google may well determine whether they find your business or not. Online reviews have long been important for local businesses and now seem to be getting even more so. If you’re struggling to get more reviews for your business, a good friend of mine has developed software that makes it dirt simple. All you need is a customer’s name and email address and the software does the rest. And does it really well. One of my clients has been using it for about 6 months. When they started, they had 2 just reviews for their business on Google. Now they’re the most reviewed, highest rated business in their local niche on Google and the other major review sites (and almost all the reviews are 5 star reviews from very happy customers!). And his results are common. The software’s been around for about a year now and the businesses using it are dominating their local market when it comes to reviews and referrals (and at $49/month, find it an incredible bargain for the results they get)! So if you want to become the most reviewed, highest rated business in your niche/area, email me now – adam (at) wordsthatclick (dot) com! Do Local Business Reviews Matter?